On Day 3 Of Cancellation Chaos, British Airways Edges Closer To Recovery : The Two-Way A "catastrophic" IT systems failure has disrupted roughly 75,000 British Airways passengers' flights since it struck the company Saturday morning. "We profusely apologize," the airline's CEO said. A board at Heathrow Airport in London displays a slew of cancellations for British Airways flights on Saturday. 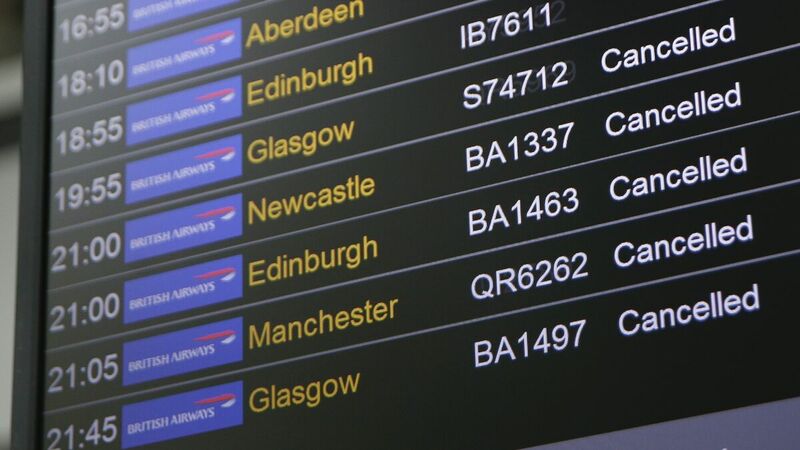 An IT systems failure laid waste to flyers' plans at the U.K.'s two major airports over the weekend, and the situation is yet to be completely resolved as of Monday. It was a rough holiday weekend for British Airways. Beginning Saturday, an incident the airline is describing as a "major IT systems failure" brought its operations to a grinding halt in the U.K. Thousands of passengers were stranded at the country's two major hubs in London — Heathrow and Gatwick — as flights were canceled, flyers endured long lines and bags became separated from their owners. In all, CEO and Chairman Alex Cruz, who has posted several apology videos of his own this weekend, told Sky News the malfunction disrupted some 75,000 passengers' flights. "We know that there have been holidays interrupted, and personal events that have been interrupted, and people waiting in queues for a really long time," he said Monday. "We absolutely profusely apologize for that, and we absolutely are committed to provide and abide by the compensation rules that are currently in place." He told the British TV network that the airline's operations are not yet at full capacity again, but that they're getting close: By his estimation, it has recovered to just about 95 percent of its typical operations at the two airports after a "power surge" had a "catastrophic" effect on its message system. He also emphatically stated that there was no evidence that the outage was caused by a cyberattack. Others have alleged a different cause for the glitch: outsourcing practices. "This could have all been avoided," said Mick Rix, national officer of aviation for the general union GMB, according to Reuters. "BA in 2016 made hundreds of dedicated and loyal IT staff redundant and outsourced the work to India." And even as the airline gradually resumes full operations after a weekend it would rather forget, at least one of its competitors has made sure to shower snark on the incident. The budget airline Ryanair was sure to pin a tweet that leveled a quip at its rival's head of IT.